You already know the problems with hard water. You can see them in your bathroom, in your kettle every where you use water, but its the hidden effects that should really be worrying you. Scale build will cause the premature failure of any electric heating elements in your home. For example in you hot water tank, in your washing machine, in your dish washer, in your iron, in your kettle and in your electric shower. Why? Scale forms when hard water is heated. It gets deposited on hot surfaces forming a rock hard coating. This insulates the heating element which causes it to over heat, over heating means early failure. The insulating effect of scale also means that it costs more in energy every time you use it. 1.6mm of scale (which isn't a lot) on the surface of any heat exchanger, boiler, hot water tank, electric element etc. will reduce is efficiency by 12%. In fact in a study conducted for the Water Quality Association it was found that gas hot water boilers using hard water used 29% more energy to heat the water than with softened water and electric boiler s used 21% more. Don't take our word for it, go and have a look at WQAs (water Quality Association) web site on our Contacts & links page. Scale also builds up inside your shower valves, taps, electric valves in washing machines & dishwashers again resulting in early failure. All this scale build up makes it harder to clean everything, and more costly. Your new bathroom costing thousands is under attack from day one, with water marks on shower screens & doors, scale build up on the shower head, valves & taps plus the grout between your tiles will dull & look dirty. Just take a look on the side of a pack of wash powder and note the differing amounts you have to use for hard and soft water. The money & time you waste on fighting scale with cleaners will pay for a water softener. And while your saving all this time & cash you will be enjoying the luxury of soft water; softer hair, cleaner fabrics with longer lasting colours, more enjoyable bathing. So why spend hundreds of pounds on a water softener when I can buy a scale inhibitor for a few pounds? The simple fact is that scale inhibitors whether magnetic or electronic do not soften water. Go and read what the scientist have to say. Links to these sites are on our Contacts & Links page. How it works: Our water softeners work by passing the incoming hard water through a high quality resin column which removes the hard minerals and exchanges them for soft ones. 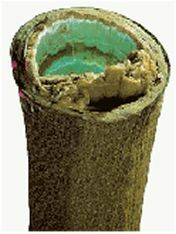 When the resin becomes exhausted it is regenerated by drawing a solution of common salt called brine-through the column. The hard minerals are then released from the resin and flushed down the drain with any excess brine. This exchange process is repeated as often as necessary. The amount of salt used is proportional to the size of the softener & the soft water produced. Large softeners cost the same to run per gallon or litre of water as small ones. How to select the right size: Domestic water softeners are sized according to the number of people using the soft water. Select the correct size by using the "number of persons" in the price list. This figure allows for the average water consumption taking into account washing, bathing/showering & laundry. If you consider your water consumption above average then choose the next size up. The exceptions are the Twintanks, 9100SE & the HomeWater softener which are suitable for any number of persons. The other consideration is the flow rate. If you have a megaflo hot water system installed and you have high demand items like power showers then you should opt for a high flow softener like the Water Boss or Homewtaer Twin 1". Theres no point in spending all that money on a mains pressure system and then reducing your flow & pressure by installing the wrong softener. For Combi hot water systems you will need a standard flow softener. Or with gravity systems (tanks in the roof & a hot water tank) any softener will do, as long as it can cope with the number of people in your household. What sort of control system:"Electronic meterd" softeners have control valves which measure & record the amount of water being used and unlike mechanical meters they can predict future consumption to save salt & water. These softeners also use a special "uniform bead size" resin & "counter current regeneration", this set-up uses a minimum of water & salt during regeneration around 30% less than a conventional softener. We have a couple on Timer softeners for low volume & flow applications. "Twintank" softeners utilise two small softeners is one. This allows the valve which monitors the water use to run each tank to its full capacity before switching over to the second tank. As water is being softened in the second tank, the first is being regenerated, once complete its stands by until the valve switches over from tank two back to one again. This duplex operation continues as frequently or infrequently as required, each time using the capacity of the softener to the full, saving salt & water (in excess of 30% over conventional softeners). However the Homewater sosfteners use a slightly differnt form of duplex opperation where both tanks are in service (providing higher flow rates) most of the time. One will drop out of service to regenertate and then come straight back into service. For advice or answers to any questions call, fax or e-mail us. Contact us. Where does the main water pipe enter your house? WHY The water coming into your house must pass thorough the softener to become softened before it goes anywhere else. Where is the nearest waste pipe or drain? WHY During the regeneration process the softener needs to wash all the hard minerals out of the soften to a drain or waste pipe. Is there a power supply or socket near by? WHY The control valve needs electricity to make it work. Where is your stop tap and does it work? WHY You will need to turn your water supply off during installation. With your water supply off, and as much excess water drained out your pipe-work as possible you need to install a 3 valve bypass system in your pipe-work, this will allow you to (if required) shut off the softener and bypass it allowing water into the house while service or repair work is being carried out. Its also useful if you move house and want to take the softener with you. Now site the softener and connect to the valves. Connect the drain, its best to use a stand pipe like a washing machine trap. Connect the electric's and you are ready to commission. Commissioning is different for each type of softener, its purpose is to fill the softener with water, wash the resin, fill the cabinet with salt, set up the valve timer or meter, and check for correct operation. Full instructions are included with each softener. Should you find the DIY route of installation too difficult a plumber should be able to complete a straight forward installation in around four hours. Should you need any advice call, fax or e-mail us. Contact us. HOW MUCH DOES HARD WATER COST? Add it all up, even with the most conservative estimates hard water cost you a fortune, British Water calculate that the average family of 4 can save around £200 a year when using soft water. Go and see British Waters Fact Sheet, links on our Contacts & Links page. On average a water softener will pay for itself in savings in a few years. The average life of a softener is 20 years (but many last longer). And for those who are not interested in saving their hard earned cash, soft water is absolutely wonderful to use, to wash in, to bathe in, to shower in and to wash your clothes in.